The healthcare reform law is still alive and the squabbling surrounding it, too stupid to live yet too overwrought to die, is reanimated. Here I go, unable to resist the smell of brains, shambling back into the scrum with the rest. In my own defense, I work in the non-systematic system this law purports to reform. I also have something more constructive to mumble than “Brains, brains!”. Just look at the objective of the law. Its primary aim is to finalize the conversion of the health insurance industry to a healthcare financing industry. In other words, to convert it from Lloyd’s of London to GMAC. This objective is very modest, as the industry is already two-thirds of the way there. Kaiser, with its souped-up HMO model, is almost all the way there. By finalizing this transformation for the whole insurance industry, the authors of the law hope to provide universal access to healthcare and control costs. These goals are not so lofty as they first appear. In fact, the second one may not be possible by legislative means at all. We already have universal access, just not rational universal access. Call 911, and someone will come to help you without checking your credit rating or insurance status. Go to the clinic because you have symptoms of diabetes, and you will not get the same courtesy. You must wait for the ensuing heart attack or coma. Objections to universal access must start with what we already have, and I think these objections, since they have life and death implications, require some earnest gesture before they get serious consideration. I’d propose an opt out. If you think our polity should not concern itself with the physical well-being of its constituent individuals, please tattoo a Gadsden flag across your forehead. Then we can demand payment up front if we find you bleeding by the roadside or keeled over on the sidewalk, or we can simply choose to pass you by. Until you bear that mark, you won’t be taken seriously. The legitimate objection regarding universal access relates to efficacy. Giving people financing, and thus access, doesn’t mean they will automatically access healthcare rationally. They will probably do a little better than they do now, but the cost control envisioned in the law depends on people doing a lot better at seeking care rationally. People probably won’t live up to that expectation. Market forces are the problem. Efficient choices in healthcare are difficult. 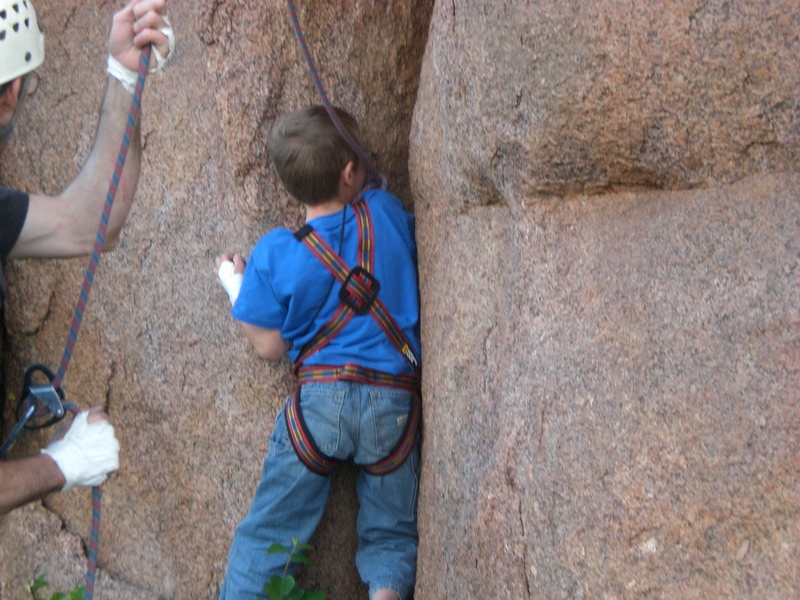 Even clear-cut problems often require some technical knowledge to allow for good decisions. For ill-defined problems, not even the experts can tell the consumer what he or she is buying. So, the consumer must make purchases based on emotional facts rather than physical facts. From the perspective of emotional facts, healthcare choices break down into two broad categories: care we care about and care we don’t care about. Care we care about is reassuring care and impressive care. Reassuring care is any care that addresses illness we fear, like cancer. Impressive care is care with visible, immediate, dramatic results, like open heart surgery. Care we don’t care about is public health and chronic care, especially if it is merely preventative. Among these two sets of choices are tests and treatments that are expensive and effective, cheap and ineffective, expensive and ineffective, and cheap and effective. The market favors care we care about, without regard to those sub-categories. Allowing people to participate in the market alone won’t help control cost, for this reason. Agency is necessary to sort care rationally, in the light of physical facts. Physicians have been the de facto agents up to this point, but they really haven’t wanted the job and therefore serve the role poorly. A financing company might be able to act as an agent, but would be limited to guiding choices among preexisting options. The Affordable Care Act contains some elements that gesture in the right direction, like ‘death panels’, ( guidance on end of life care). People don’t like those elements because they seek to rationalize, and thus ration care, which entails a loss of autonomy. People are loath to cede autonomy to any agent, especially a visible yet impersonal one like a panel, real or imagined. Until doctors choose to willingly alter their practice and fully embrace the role of agent, everyone will continue to get expensive and ineffective care we care about, and do without cheap and effective care we don’t care about. To that end, the recent fights over USPSTF recommendations for cancer screening are the sort of fights we need to be having. We’ll see if the political process will allow those fights to go on and spread. As for the ACA, whatever, it’s a start. At least it doesn’t propose to expand market distortions until care is rationed by price alone or beg for a forehead tat. People have traditionally followed two divergent paths to righteousness, a hard and heavy path and a soft and squishy path. I mean old testament versus new testament, duty versus faith, Catholicism versus snake-handling. Most religions contain both these elements and maintain them by cognitive dissonance. Blessed are they who try to reconcile the paths. The task is impossible and it only ever turns out one way. Many, many examples of the inevitable outcome exist, from the Sufis, to the Chan, to the Kabbalists. The relevant lot from the Christian tradition are the snake-handlers and they are the best lot of them all. 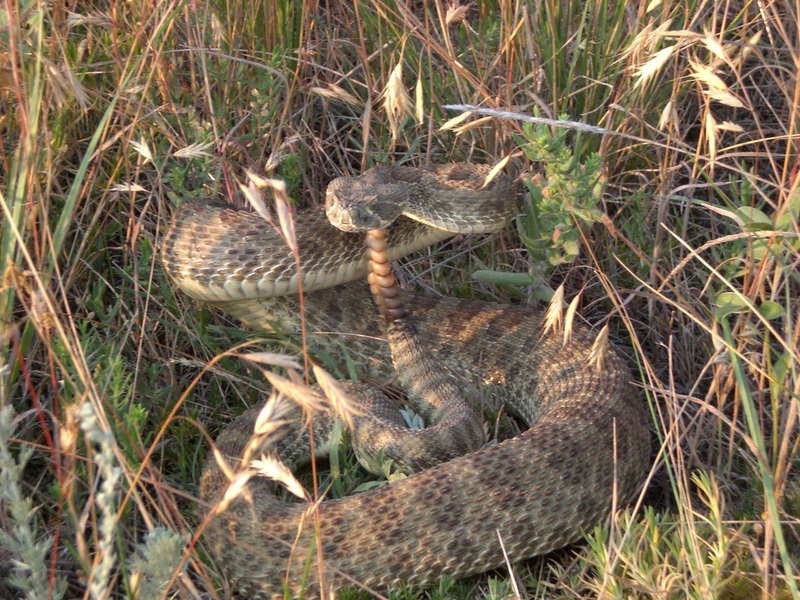 Math, meditation and music do have the power to transform, but a handful of rattlesnakes is clarity itself. Like all sects that get involved in changing how members are as well as what they do, the snake-handling churches subscribe to conventional scriptural authority. Most are even literalists, and quite austere literalists at that. In typical fundamentalists, literalism makes for a dull theology, fearful and full of contradictions. For the snake-handlers however, the rules and regulations, just like the snakes, are guides to align a person’s trajectory. The target is a right way of being, not just a right way of doing. The Holy Spirit subsumes scriptural dictates. The soft and squishy way absorbs the hard and heavy one. This arrangement of the spiritual food chain is necessary, because the hard and heavy way is not real and it must go under. The ought isn’t. Ask for a definition of Good. A clever theologian will say it is like a primary color – something we can know, but not describe. A less clever theologian will tell you it is what one is told to do. The guy on the bar stool next to you will say it is what he wants. Good is a stick. It can point. It can start a fire. It can crack a skull. Good is all of those things that the theologians and the drinker wish it to be, because moral good is an error of language. Good begins as what we want, then we want things of others, then we need to tell others how to give us what we want. We start using “good” in the first case and carry on through, watching the word transform itself from a mundane descriptor to an ethereal being. The truth is, “good” remains a descriptor all along and as we boost it to higher and higher levels of discourse, it is the concomitant release of dopamine that makes it radiant. Used in a sentence and pursued through right actions, good’s charge is grounded, contradictions multiply, and the glow dissipates. 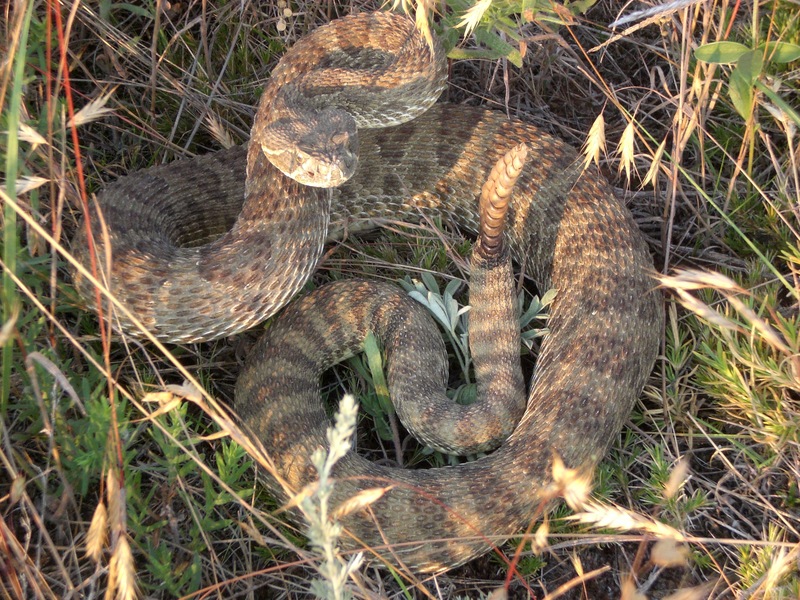 What’s left for us is a handful of rattlesnakes, which is preferable. Though an ‘ought’ reconciles the act with scripture, no ‘ought’ drives a believer to pick up a snake or drink poison. He is determined to do those things by his faith. His faith is made of his history, recorded in his genes by forgotten generations of ancestors and accumulated over the moments of his life. In devotion to his faith by acts, he becomes concordant with the truth of that history: he is not a discrete entity. Sounds awful squishy, but that’s what we are, squishy globs of history on a very squishy path. No wonder we like to think solid entities like good and evil might exist to make a channel for us. We must live with our inherent imprecision, though. As messy as it may be, it is still less messy than pursuing an error. The thunder’s rolling now, but the weather was glorious at the Needle’s Eye this afternoon. It’s been beautiful in the Needles all Spring. 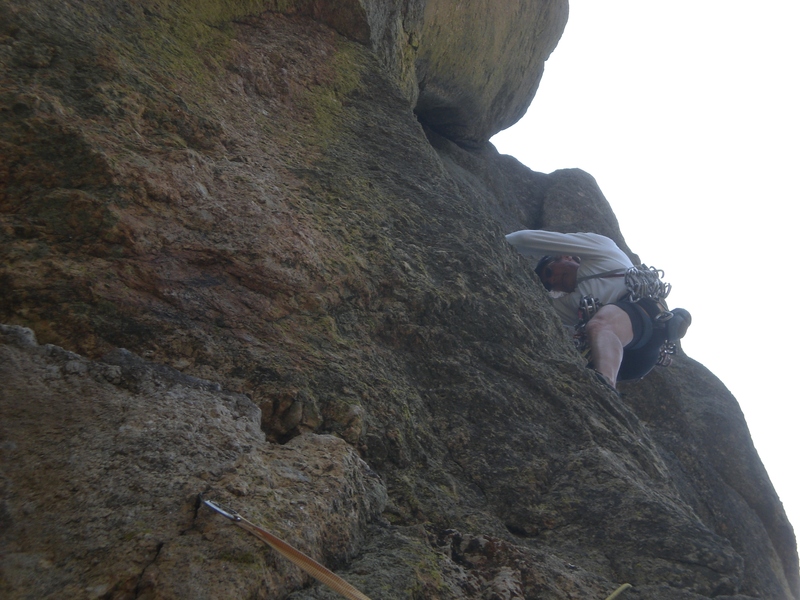 The picture above shows Rich on the first 1/3 of the Larry route on Blockhead. “Five nine” says Larry. I’m not convinced. 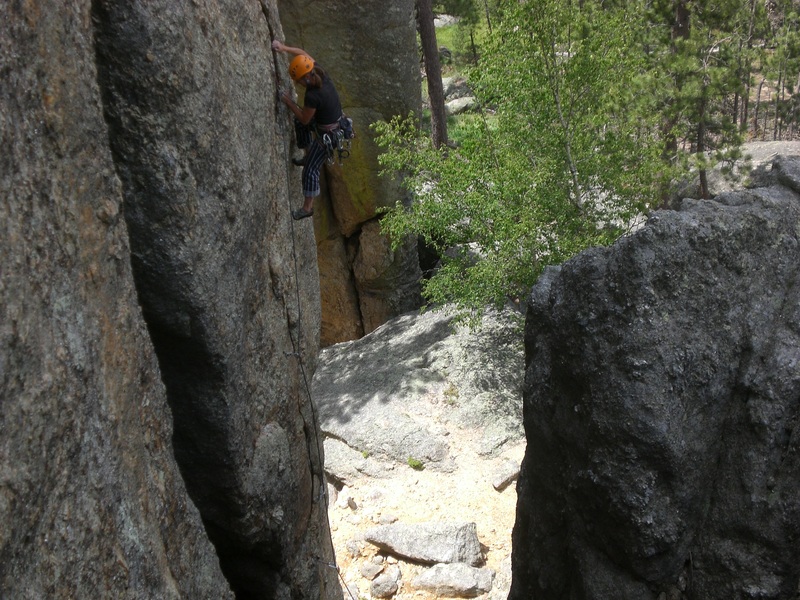 It’s hard to switch back and forth between the Tower and the climbs in Custer State Park. The gear at the Tower is generally straightforward and the falls are clean. Needles placements are devious and you really shouldn’t fall. You always feel off-balance. 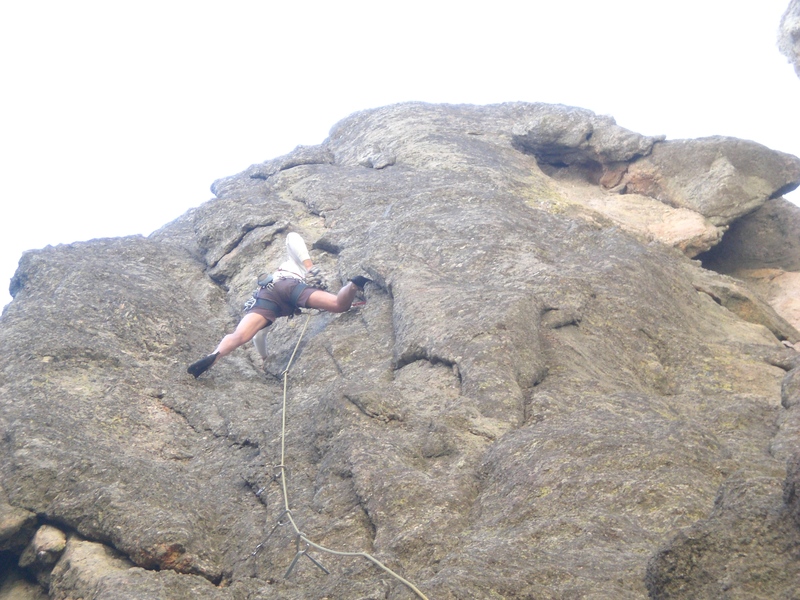 Climbing doesn’t need Title Nine, it’s got Cheryl. Rich got to lead Sore Thumb first this year. This spire is the climbable Escher. 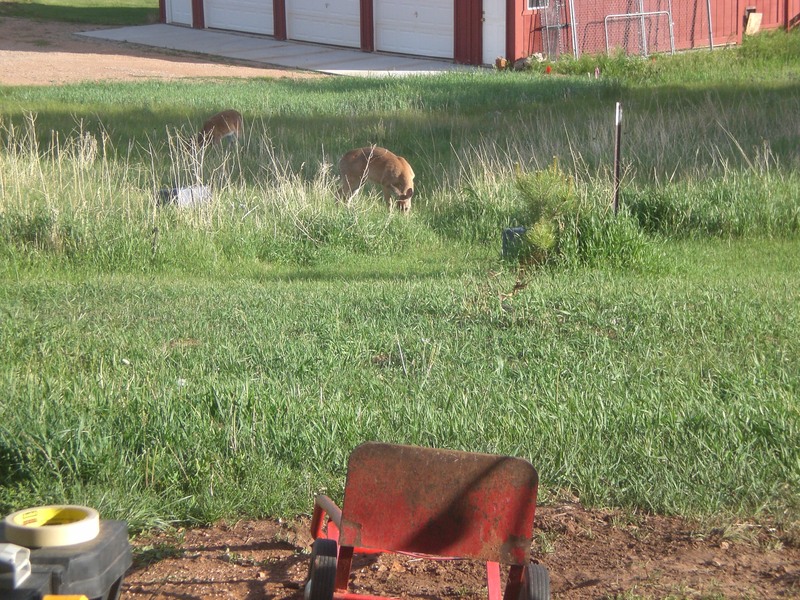 …in Wyoming: “Yes neighbor, my pick-up truck is paid-for.”, “Yes darlin’, I won my belt-buckle in the rodeo.”, “Yes sir officer, I was just trying to help that ewe back over the fence.”. Like any terra incognita, Wyoming has accumulated quite a bit of mythology. Mythology should be debunked, but it is notoriously resistant to fact. So even though Wyoming is not just rednecks and national parks, I know that I can’t prove that with data. Gestalt is the remedy. Here is the feel of the place – the good and the bad. The Weather: Much of the state is arid or semi-arid and above four thousand feet. The sun shines a lot. In the Summer, even if the day is hot, the night will be cool. Because the humidity is very low, sweating works. By the same token, low Winter temperatures often prove much more tolerable than the thermometer alone might imply, due to the sun’s warmth and the dry air. 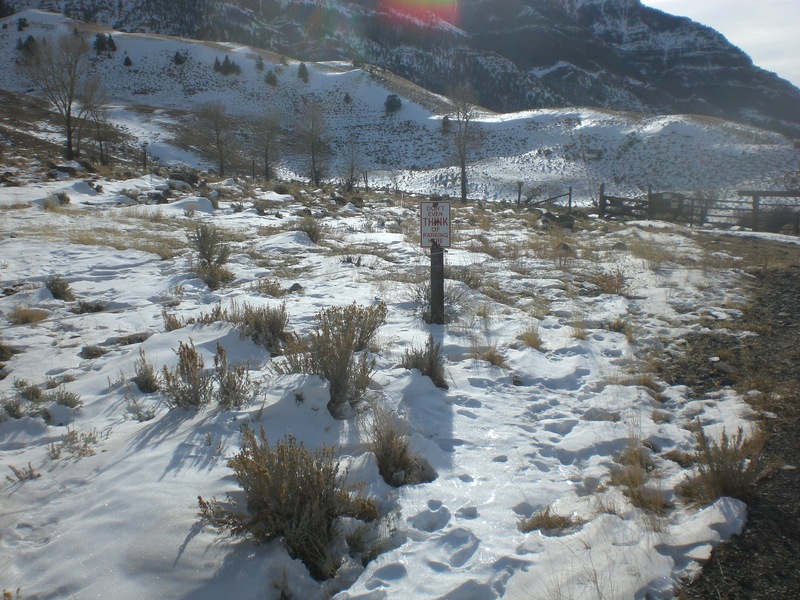 Geology: Uplift, sedimentation, erosion, volcanism – Wyoming has it all. Many states have mountains, but none have the sheer profusion of geological features and types of rock found in Wyoming. 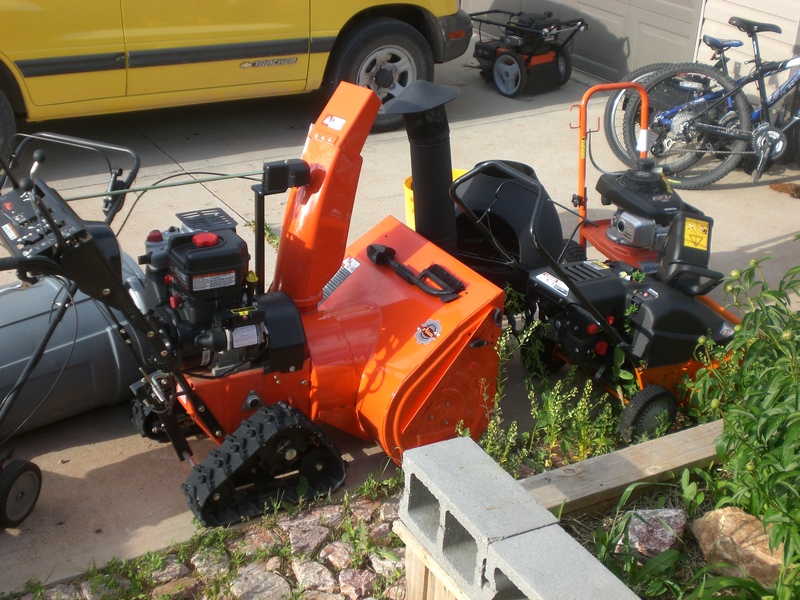 Self-sufficiency: A state economy based on mineral extraction and agriculture, sparse population and dearth of urban amenities have bred a powerful streak of self-sufficiency into the inhabitants of Wyoming. This quality leads to a breadth of experience in the populace, with an attendant measure of curiosity. Self-sufficiency also makes for humility and an appreciation for the knowledge of others. Nothing shows a person their limits and cultivates a taste for learned advice more than mandatory DIY. Being far from help makes one value help and be willing to lend it too. It’s rare to see a single car with its hazards on by the roadside in Wyoming. 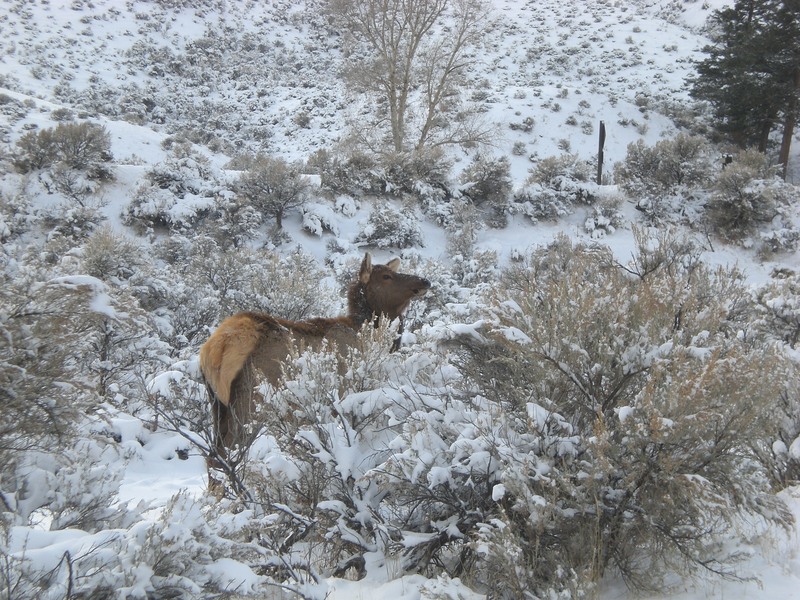 Critters: Deer, Bighorn Sheep, Moose, Elk, Wolves, Mountain Lions, Bison, Antelope – you get to see them all, up close and personal. 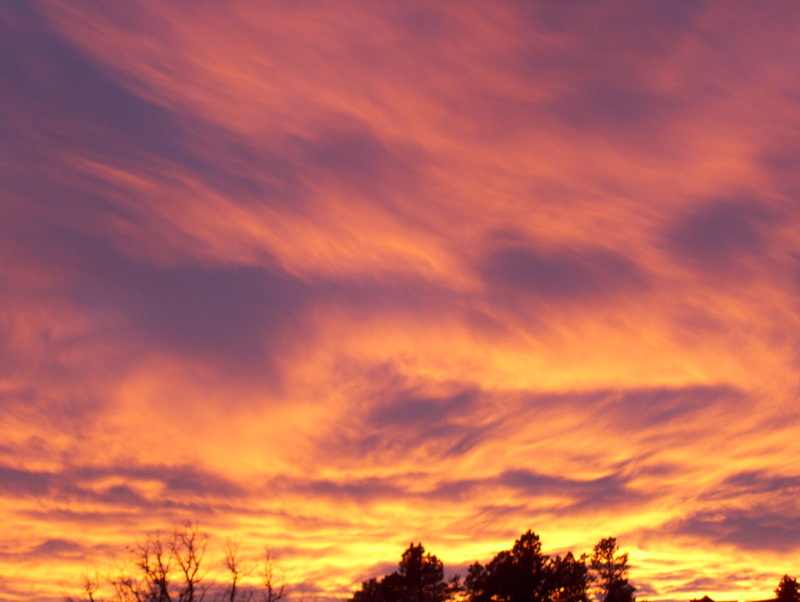 The Weather: Sometimes the place catches fire. Wind is considered a natural resource. Remember the line from the song Oh Suzanna, “…the sun’s so hot I froze to death…” ? Wyoming is the place that makes sense of that line. 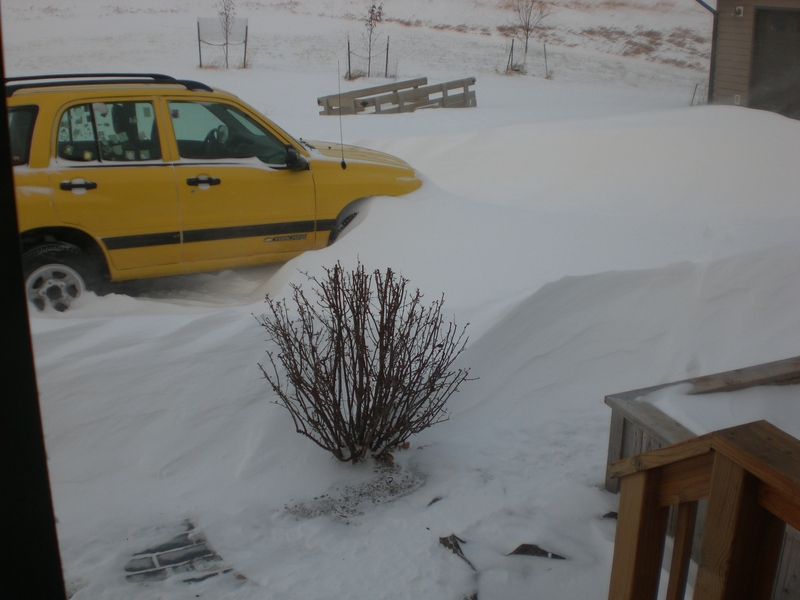 The snow forms ten foot drifts as hard as concrete and the snowpack is often a thin crust over bottomless depth hoar. There are frequent ‘ground blizzards’, with blue sky above but impenetrable white in every other direction. Geology: Unfortunately, geology translates to geography. 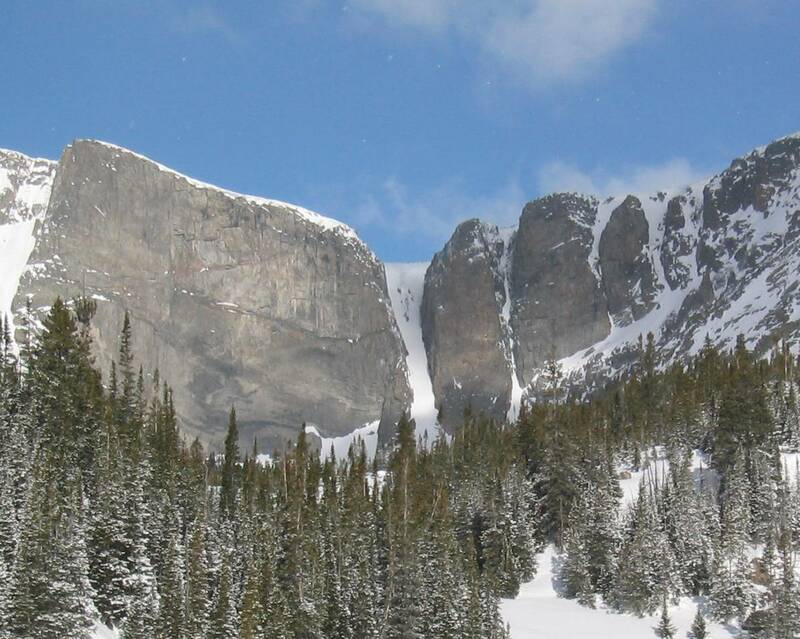 Monumental forces make for monumental obstacles – expansive basins and high, jagged mountain ranges. A short drive is anything less than 400 miles. A short walk is anything less than 6 miles. Self-sufficiency: The habits of self-sufficiency lead to a surfeit of caution and a preference for ‘good enough’. Enterprises are frequently one-of affairs. The atmosphere is friendly for extractive industries and Republican politicians, as it is in third world countries everywhere. Witness the number of ghost towns in the state. 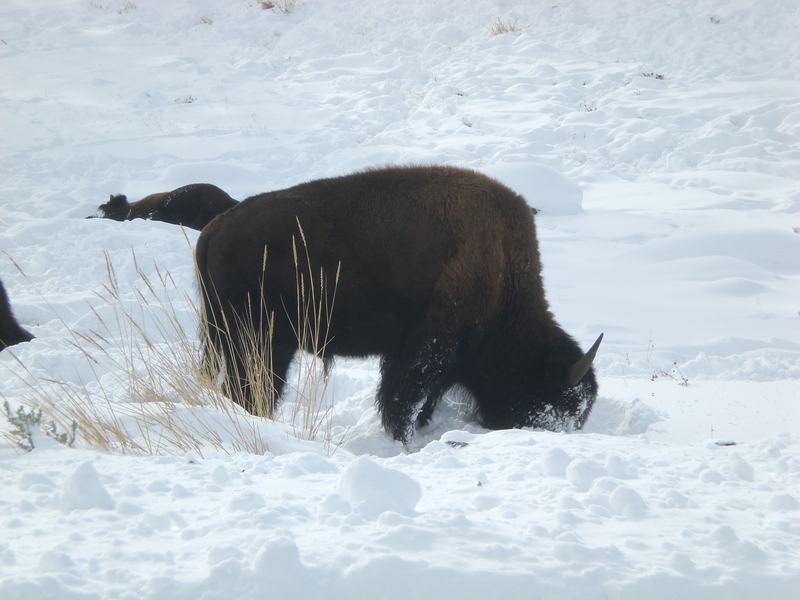 Critters: Deer, Bighorn Sheep, Moose, Elk, Wolves, Mountain Lions, Bison, Antelope – you get to see them all, up close and personal. Don’t feed the dog outside. Keep the collision insurance on your car. Buy an orange hat and a can of bear spray. It’s June at the Tower. 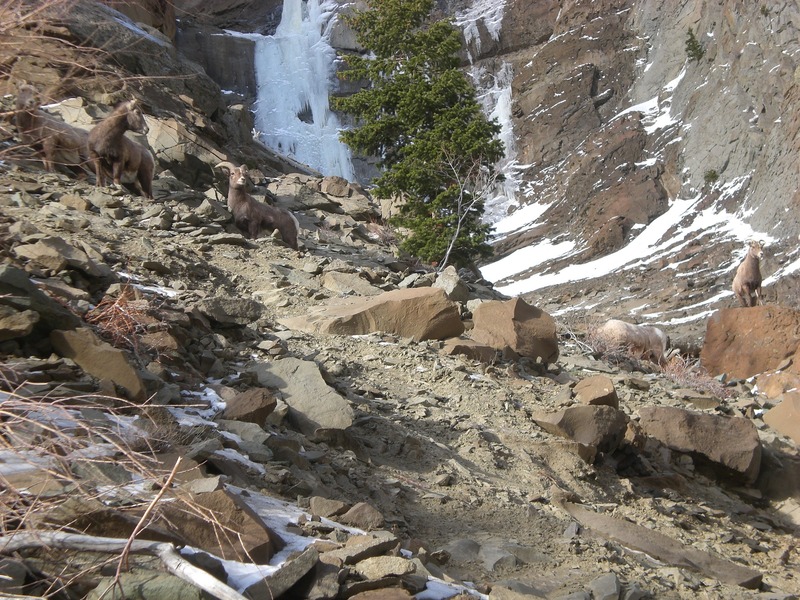 This month is a designated time for reflection and choice, brought to us by the NPS, the Constitution, and the former exclusive residents of the Black Hills. 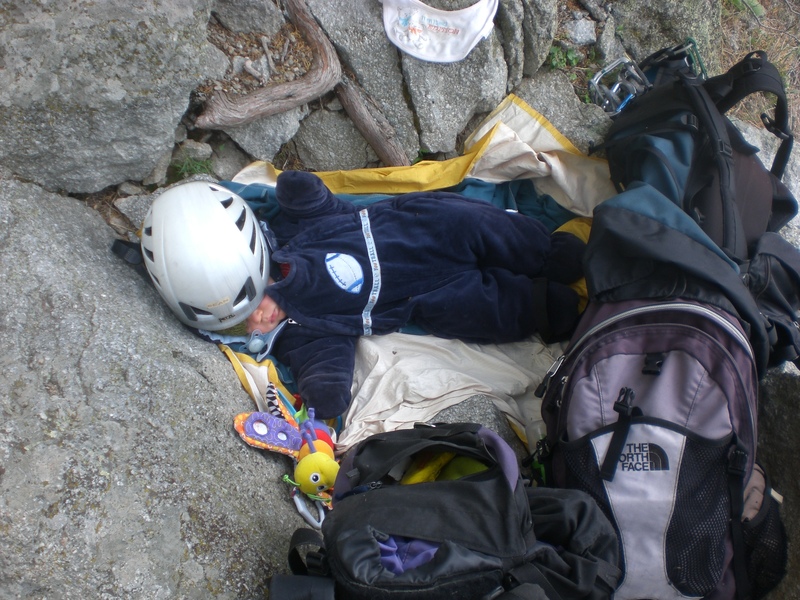 A decade or so ago, the Park Service did what Solomon could not, it divided the baby. 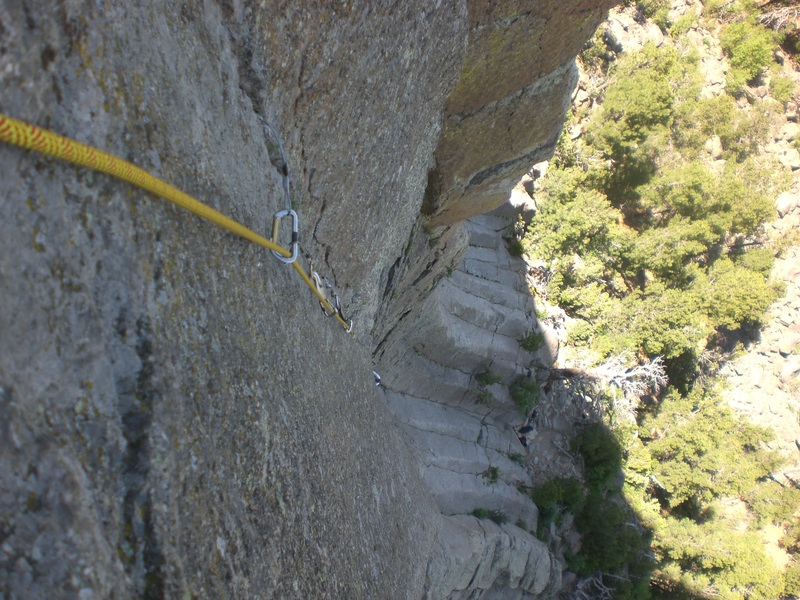 Climbers wanted to climb the Tower without restrictions. Tourists wanted to see the Tower unadorned with climbing anchors. 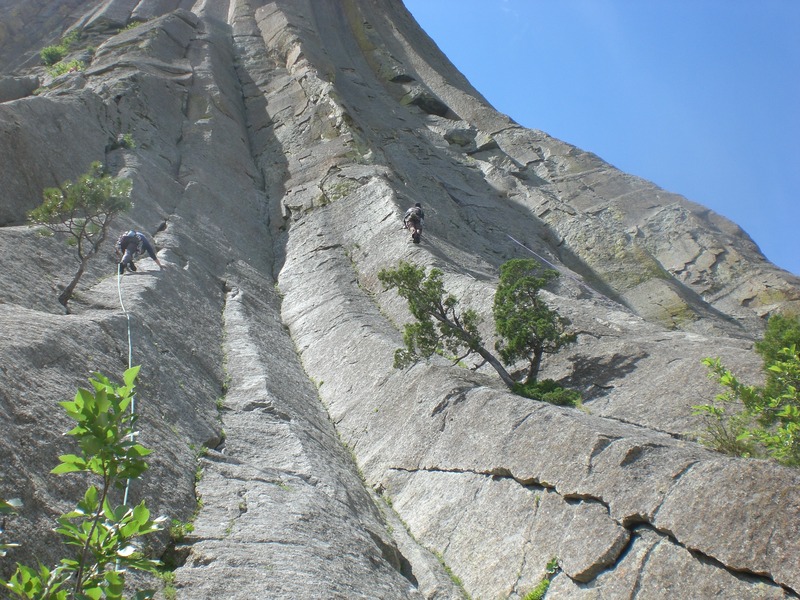 Native people wanted the Tower back, and if they couldn’t have that, they wanted climbers off the Mato Tipila altogether as climbing was felt to profane this sacred place. 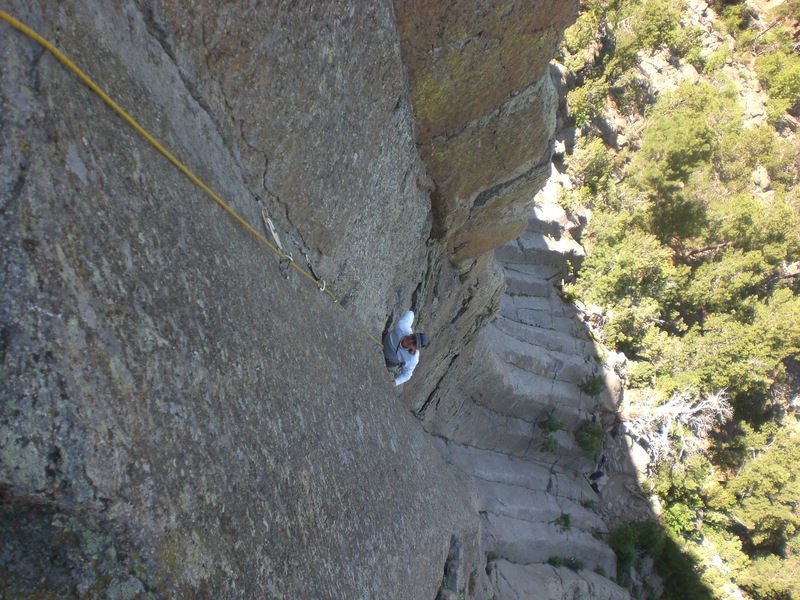 In a brilliant compromise – by definition, a deal everybody hated but nobody felt that they could reject – climbing continued with some restrictions. No new bolts were allowed. Anchors were standardized to a low profile set-up. This kept the tourists happy. Signs directed the tourists and climbers to stay on the trails around the base and climbers were asked to stay off the Tower in June, the time of the solstice, when the Sun Dance occurs. This didn’t make the Lakota happy, but it tamped down their indignation enough that they signed on to the agreement. 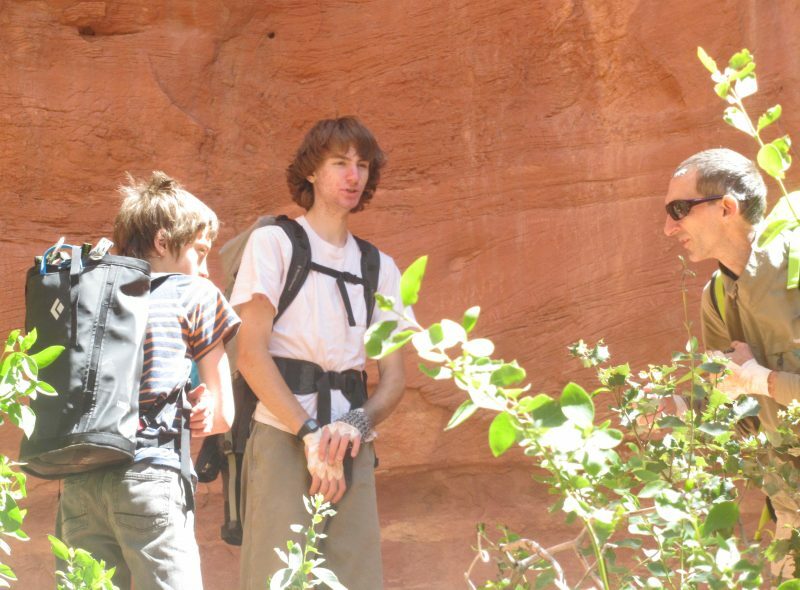 Some of the climbers sued. This response was predictable and predicted. Political philosophy is circular, with the poles af any creed resembling each other in practice. 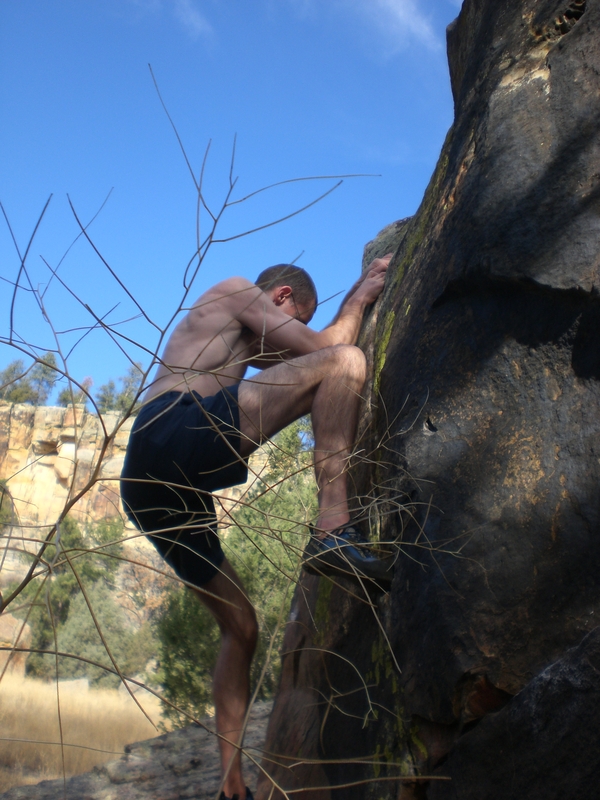 So it is with anarchism and libertarianism, two vigorous traditions in the climbing community. Followers of those traditions were obligated to oppose restrictions on principle. Fortunately, traditions based on opposition to law don’t often fare well in court. For one thing, they have a problem with consistency, since that, too is a sort of limitation on personal freedom. 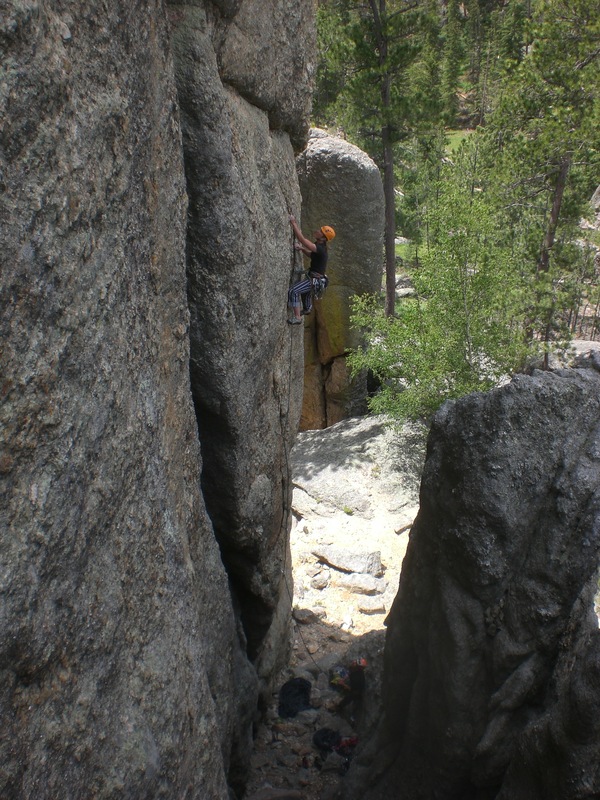 In this case, the plaintiffs even made the dangerous assertion that restrictions on climbing violated the constitution’s ban on restriction of religious practice, as climbing was a spiritual pursuit. 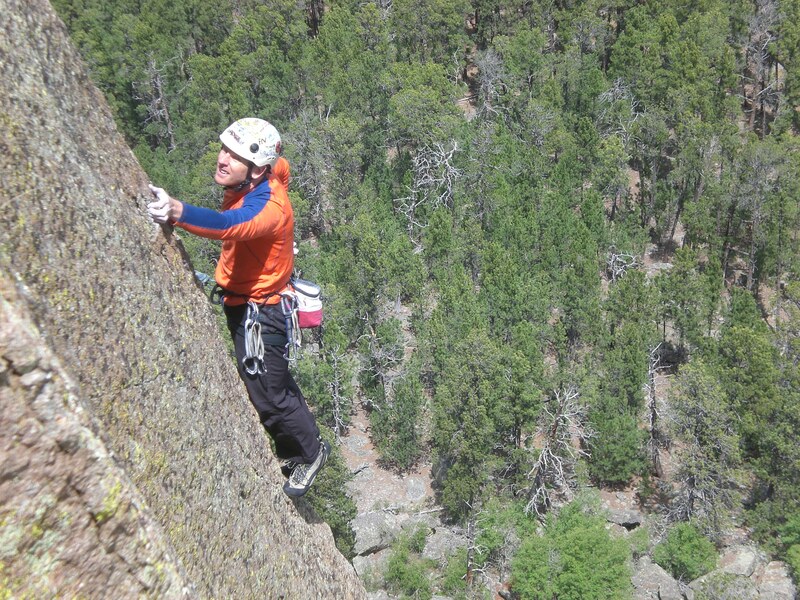 The assertion was dangerous because the suit was based on the accusation that the June ban on climbing amounted to a government agency promoting a religious practice. 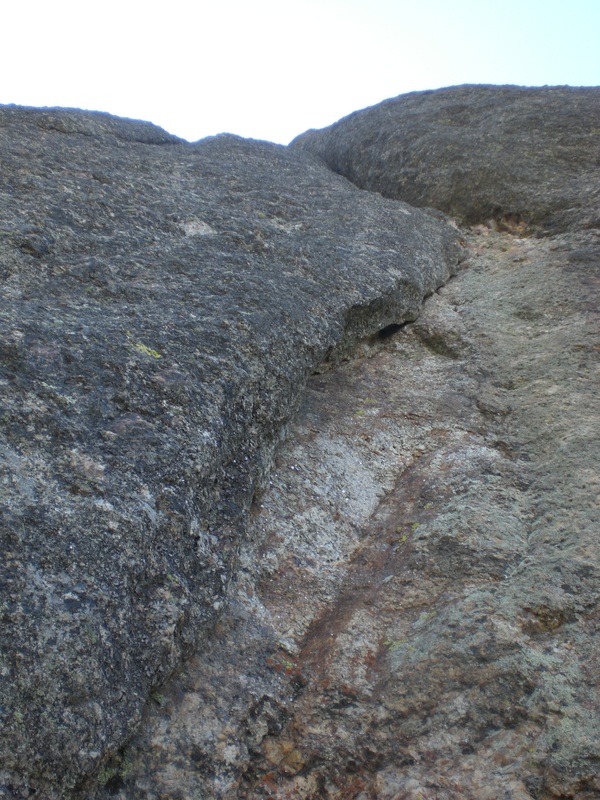 The court chose not to engage on that front, and in the end, the voluntary closure and the climbing management plan survived. The status quo is not entirely healthy though. Native rites get respect thereby, but it’s the kind of respect given a dead relative disliked by the family in life. Despite the sad eyes and solemn words, if the deceased stood up and spoke again, no one would cheer. Native people deserve space, not just allowances. 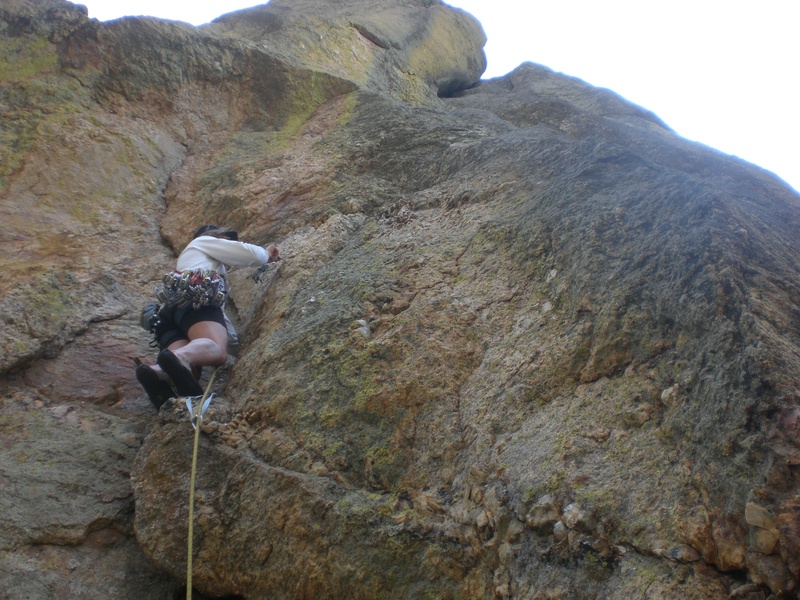 The voluntary ban confirms climbing as profanity. Nobody can stop you from swearing, it implies, so we ask that you lower your voices and keep it away from the children. 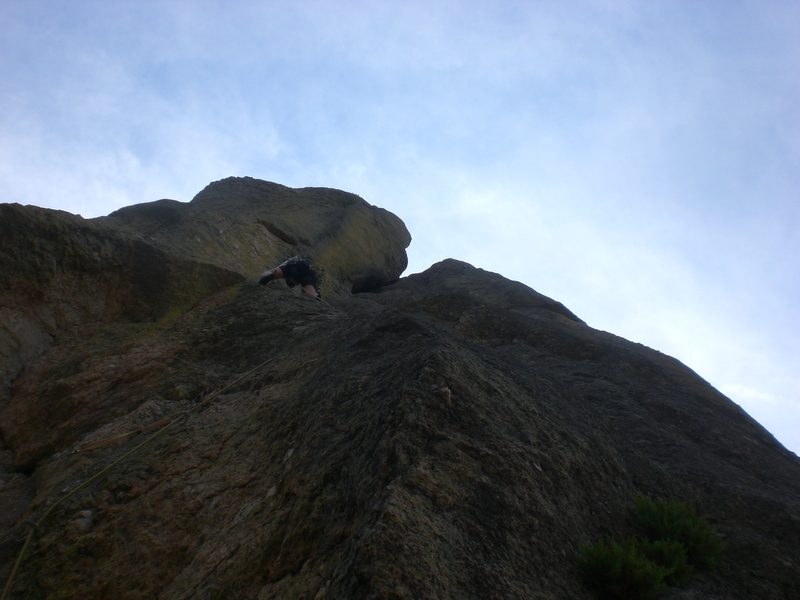 Climbing may not be religion, but it isn’t profanity. It is closer to art and I’ll be bold enough to say, art on the Death of a Salesman rather than the musical theatre end of the spectrum. Art deserves space too. The missing piece is, of course, the Tourons. 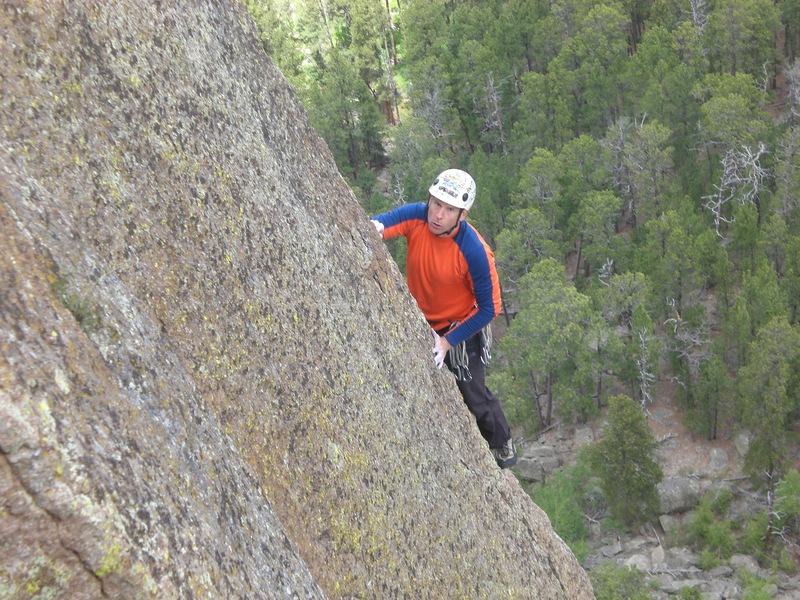 Climbers calling “On belay,” 200 feet off the deck are intolerably disruptive. Revving Harleys in the visitors center parking lot apparently are not. Of course those RV, motorcycle, and charter bus pilgrims don’t mean to intrude, they just don’t know any better. They constitute the majority of the voting public, and like the song says, this land is their land and the NPS doesn’t dare make any demands of them. The NPS anticipated all this. It plans to educate its way out of the Yugoslavia it has created. I wish it luck, but a resolution will take more than the passive approach pursued so far. The NPS has focused on the tourists, who aren’t mad at anybody. The indians and the climbers have been left in their respective corners. Maybe Sarajevo felt a bit like this in the Tito era. Maybe it won’t blow up again during my climbing lifetime. I’m not sure whether to hope for that or not. I should have known better. The term “blowout” is never associated with a good aftermath. At best it entails something nasty issuing from an orifice of some sort. I prefer the Tour de Tower, which is a trip around the monolith, hitting as many routes as possible along the way. 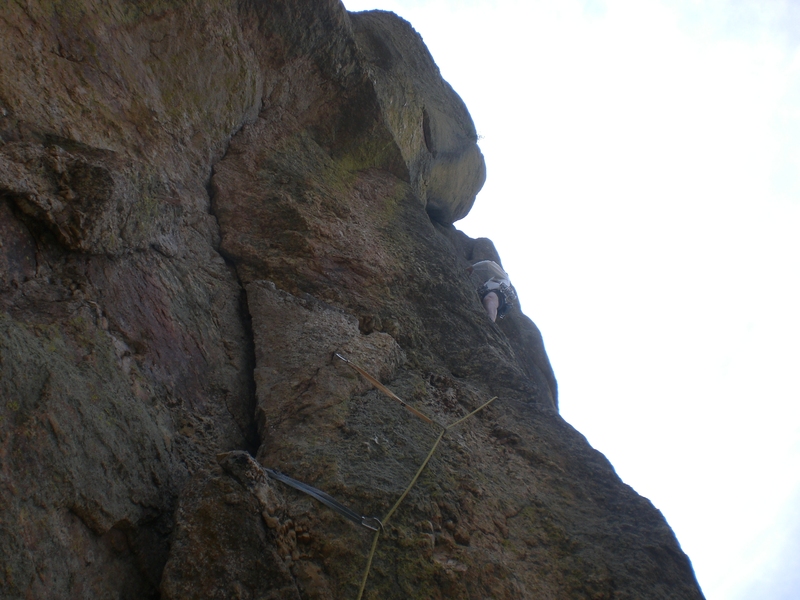 Some of those routes may be Killer b’s (the 10.b grade at the Tower is a universal sandbag), but not a bunch of 11’s. For me, those are still part of a three route regimen: one warm up, one desperate struggle, and one warm down to wash away the cotton-mouth. When Mr. 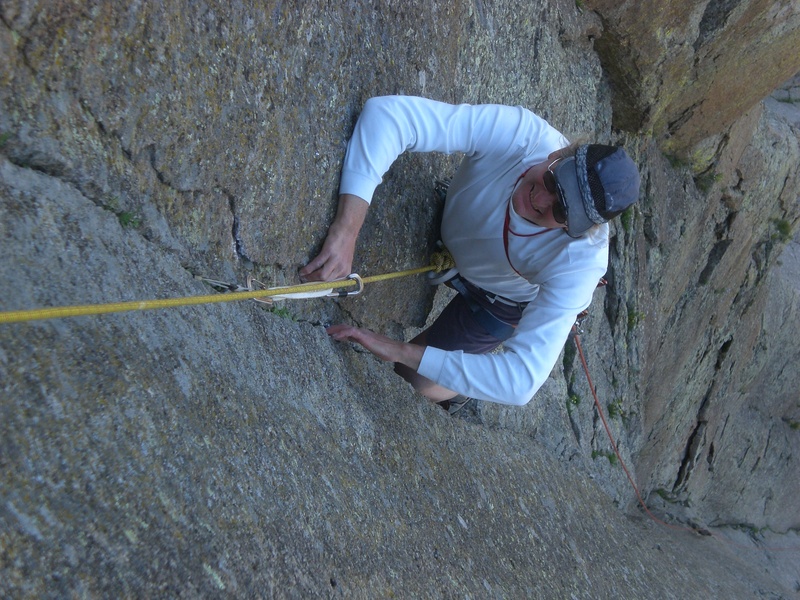 Swift suggested the blowout before the voluntary June climbing closure, I figured it would be OK. He’d lead all the hard pitches. 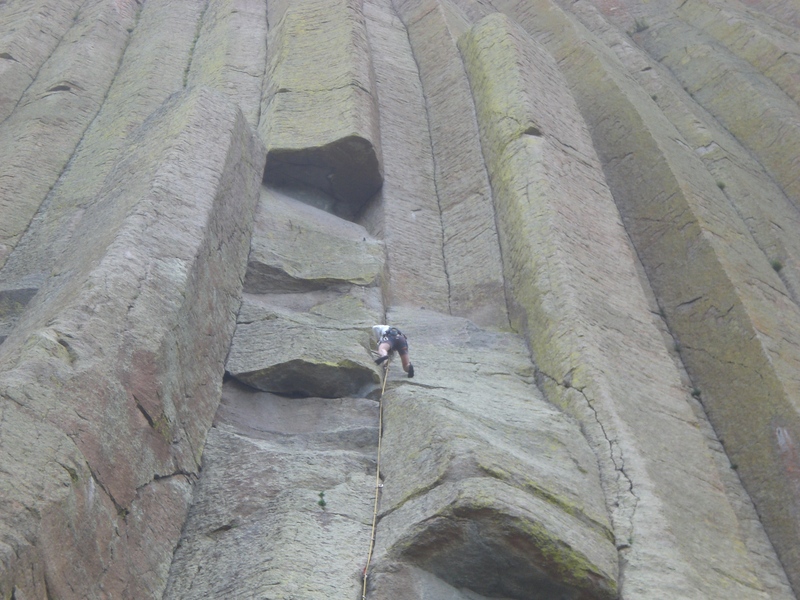 Nobody can string together those steep, crimpy slabs and fingertip cracks all the way around the Tower without getting tired. I’d lead the approach pitches and then, when he folded, I’d take over and ease things back into the classic tour. He didn’t fold, he escalated. Before it was over, I found myself on routes I wasn’t sure I could even follow. I managed, but only just. When it came time for the warm-down, it was I who was forced to quote the great Roberto Duran. No mas. At least all that time on the dull end allowed me to get some amusing photos. Anonymous climber on Everlasting, aptly named since you’re sorry you got on it by the second clip and then it just won’t end. 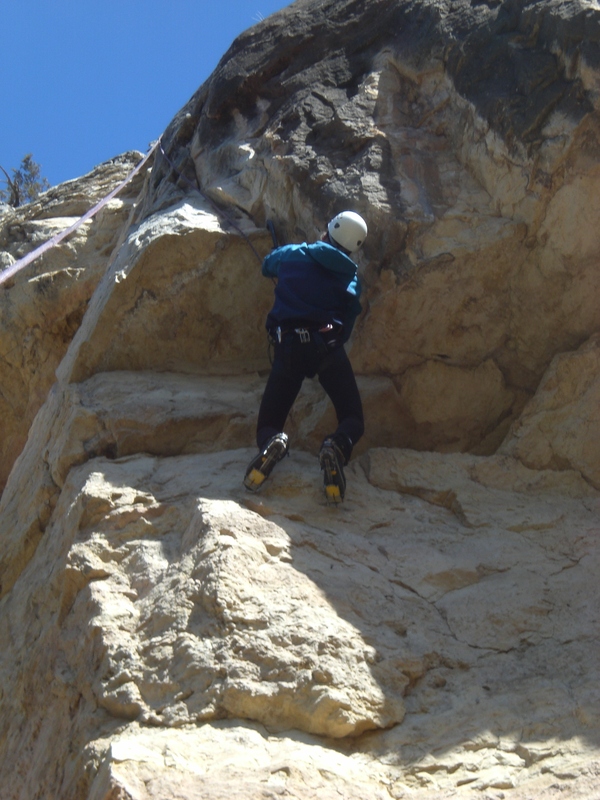 It is important to chalk up here to take your mind off the crappy footholds. Busy day on the NE shoulder. Baby bird doing what good babies do best.